Avoir le vent en poupe | One quality, the finest. 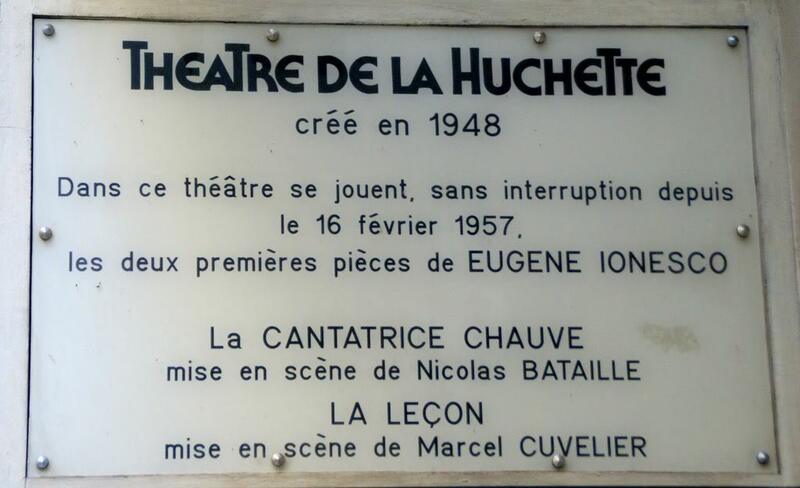 Le Théâtre de la Huchette, 5 rue de la Huchette, just a block away from Notre Dame, has been offering the same play since 1957, Frano-Romanian Eugène Ionesco’s anti-play La Cantatrice Chauve (The Bald Soprano). I first came upon this tremendously funny absurdist play in a language lab. The problem was that I was laughing so hard reading the scene between M. and Mme. Martin that my teacher couldn’t help me with my pronunciation. I didn’t see the play live until a couple of weeks ago and it was even more fun than the first time I read it. The theatre is very tiny, with the capacity for about 85 people. Ionesco, who was less beloved by the critics than he was by the public, had a healthy attitude toward being produced in such as small theatre. “Better a big success in a small theatre than a small success in a big theatre or a small success in a small theatre,” he is quoted as saying. The program is simple and unvarying every Tuesday through Saturday: 7:00 La Cantatrice Chauve, 8:00 La Leçon, another Ionesco delight. At 9:00, there may be a non-Ionesco production that does change a few times a year. While the main plays don’t change, the actors do. There are about half a dozen actors who can play each role, so the M. Smith you see one night may not be M. Smith the following night. In fact, the person who played M. Smith may now be filling the shoes of the Fireman. You can buy tickets for one or both shows. The full-price fee is 22 € for one show, 34 € for both, which has got to be one of the best live theatre deals in Paris. The language is simple enough for an intermediate French speaker, so don’t hold back the next time you are in Paris. Today’s expression, avoir le vent en poupe (avwahr luh vehn ohn poop) literally means “to have the wind in the stern.” We would say “to have wind in one’s sails.” It’s used to refer to something that becomes an ever greater success. I would say that a play that is the Guinness Book of Records holder for the longest continuously running play in the same venue fits the bill pretty nicely. This entry was posted in Theater, Travel and tagged avoir le vent en poupe, Bald Soprano, Eugene Ionesco, La Cantatrice Chauve, La Leçon, The Bald Soprano, theatre de la Huchette, theatre of the absurd. Bookmark the permalink. Pingback: Un faux frère | One quality, the finest. ‘The Mousetrap’ is notably longer-running – see http://en.wikipedia.org/wiki/The_Mousetrap, — regardless of any Guinness listing to the contrary. I should have been more precise. 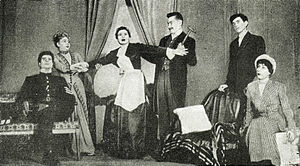 La Cantatrice Chauve is the longest running play in the same theater. The Mousetrap moved theaters in 1974. You are quite correct that it does have more total performances. I saw both shows in 1966.